grass stains: Surprise at the beach! 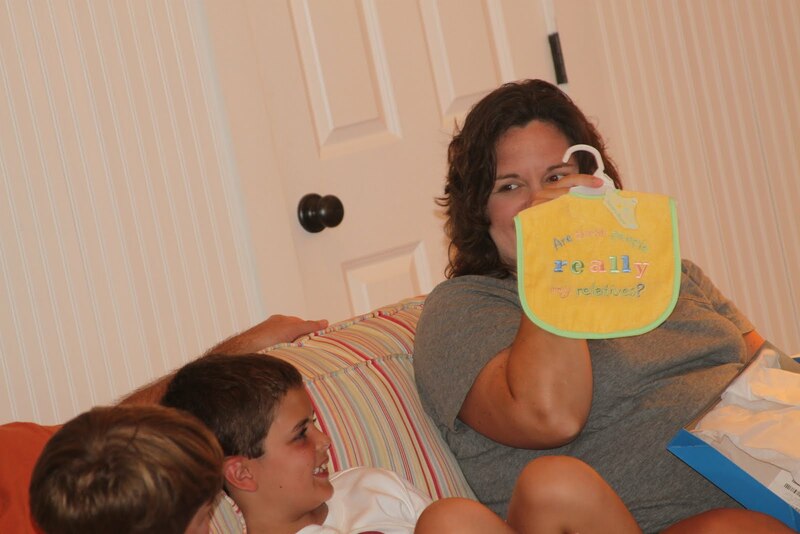 When we were at the beach week before last, we got the sweetest surprise from Grayson's family! We were sitting around the den after supper one evening when all the kids (who'd been out on the deck working off some energy -- or so I thought) came in and yelled "Surprise!" I was sitting on the couch, and I saw Tiffany bringing a cake in to the dining area. Now you might think I'd have caught on right then, but I didn't. 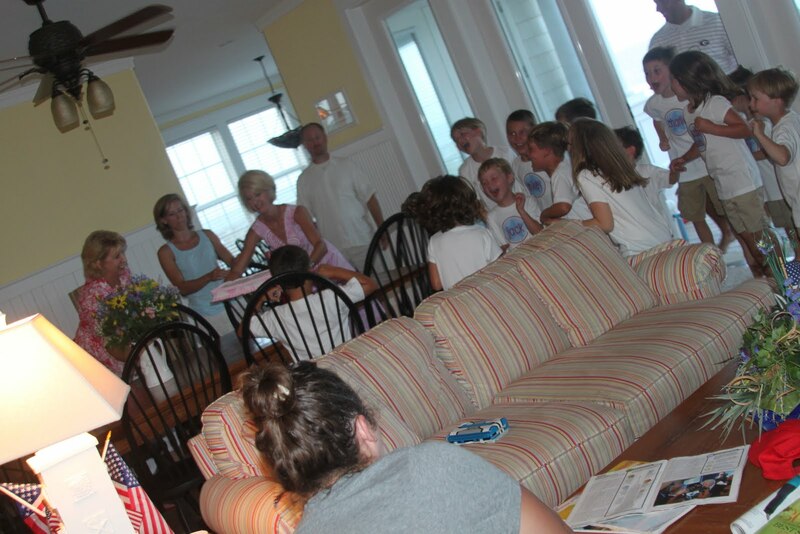 I was completely oblivious to the fact that this was the beginning of our surprise baby shower ... that's me, above, sitting on the couch in a grey T-shirt and wet hair up in a bun. I thought that since Bill's birthday was coming up, it was a birthday party for Bill (we do a little celebration every year at the beach for him). 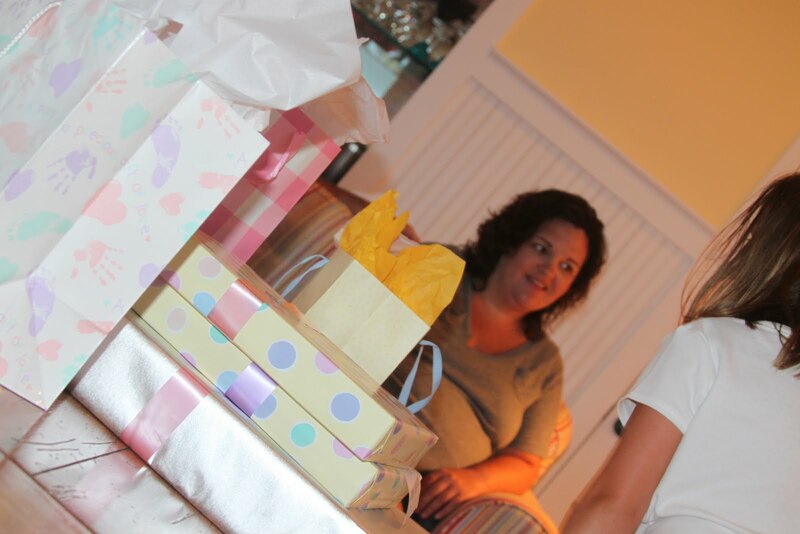 So they had to TELL me it was a baby shower for us, and I was like, "WHAT? Are you kidding? How wonderful!" And then I started thinking about how I had no makeup on, my wet hair was up in a bun and I was wearing a grey T-shirt that was doing me no favors. So I did the only thing I could do: I took the scrunci out of my hair while they set up the cake and brought out the gifts. 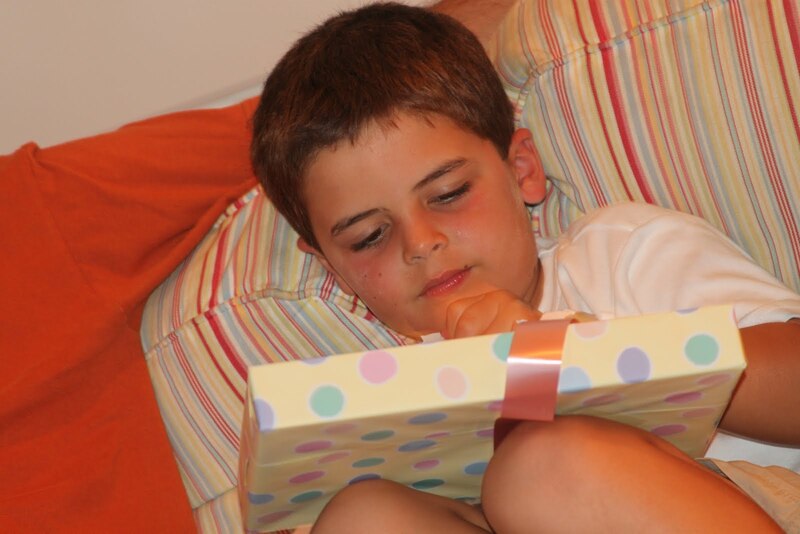 Once everything was in place and the family had come over to the den area, we began opening the gifts. The boys helped. Can you see what this bib says? It's from our brother-in-law Gerry and says, "Are these people REALLY my relatives?" Everyone knows what huge fans of Star Wars our family is, and Kim and Andrew gave us a Princess Leia onesie and cloth rattle. HAVE YOU EVER? So cute. And I'm pretty sure our baby will be the only one at daycare sporting one of those Leia onesies. 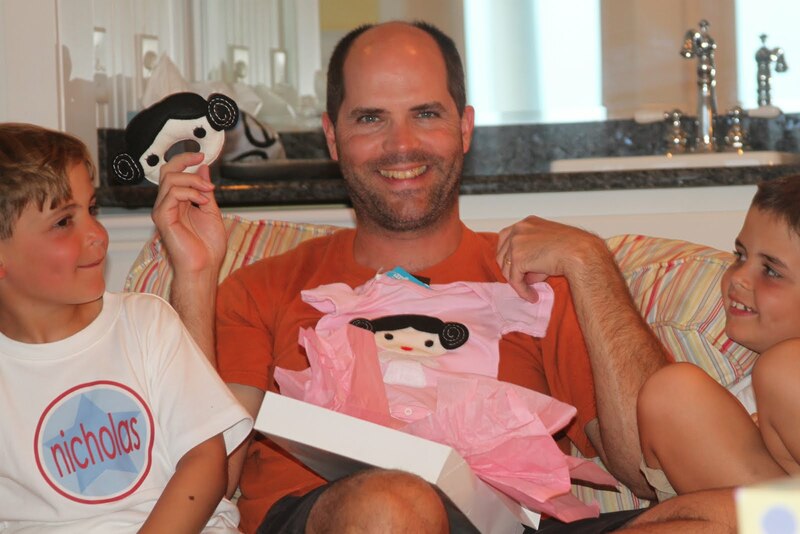 The gifts were so generous, and each of them was something we don't already have. We got this great car seat handle cover from Heather and Adam, which will be the first one I've ever had. It's supposed to keep your arm from chafing when you're carrying the infant seat around for those first several months. Isn't that fabric pattern adorable? I love it. We actually received two of this next item, one from Tiffany and Gary and one from Patsy and Bill ... Patsy and Tiffany are mother and daughter and clearly think alike. I'm totally fine with having two, though, because Nicholas is 6 years old and still likes his blue one (he doesn't carry it anywhere, but he likes for it to be nearby when he sleeps), and quite frankly we could've used an extra one since his is a little, um, faded these days. We also received several REALLY cute outfits ... Debbie and Gerry and Patsy and Bill were into the pink-and-chocolate look this year. Which is great, because so am I! And our family friends who were on the trip with us, Cathie and Dave, gave us a beautiful gift of a necklace. The centerpiece is Grayson's and my combined monogram, and there's a charm for each of the boys' first initials. PLUS, there's a question mark for the baby girl's first initial, since we still don't have a name for her. Isn't that sweet? Cathie said that once we decide on a name, we can swap the question mark out for the correct letter. We were so blown away by everyone's generosity, and the surprise element was TRULY surprising! Such a sweet time celebrating a momentous event with and for our family. Thank you, everyone! We love Little Giraffe blankets here, too. If you find the car seat handle cover helpful, will you let us know in a few months? I've always wondered if they actually work. It's definitely a great idea in theory! So much fun! 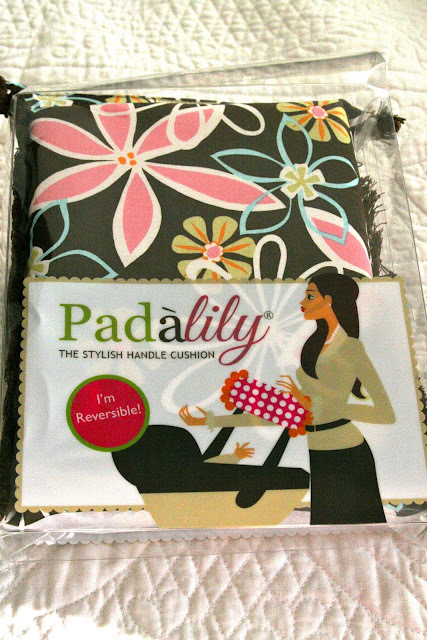 We have the carseat handle cover for Anderson and I love it. It really does feel better on your arm. You got some great gifts. 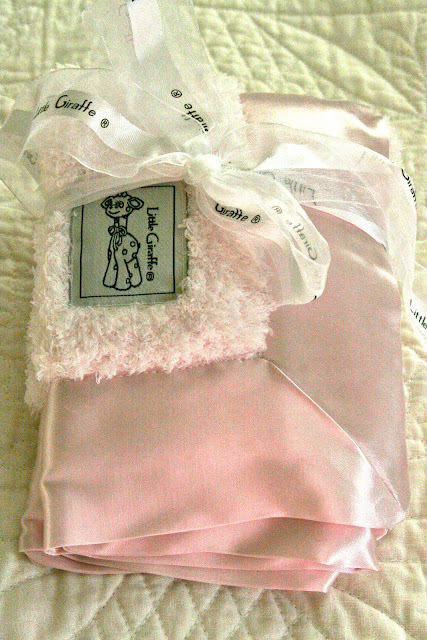 I'm so excited to hear your little girls name when you pick it out! How fun! Love how they "got cha". I have not seen the car seat cover...what a great idea! What did the boys think of all the girlie things? I still can't wrap my head around the fact that you're having a girl. So weird. Fun times! Can't wait to have that girl initial to add to the necklace - so glad you like it.